Beach grasses are just that--grasses that grow on sand dunes along coastal areas. They can be found thriving almost in the water, or quite a distance away from the beach. Some are native to the United States, while others are not. One is even considered to be a problem plant. Beach grasses, with their gently swaying stems, are classic symbols of the wild, undeveloped beaches in America. There are two primary species of beach grasses in the Unites States, and one uncommon species that is actually a subspecies. The first, and most common, according to the University of Texas, is American beach grass (Ammophila breviligulata). The second species of beach grass is called European beach grass (Ammophila arenaria). The third, which is limited to one area, is a subspecies of American beach grass. It is Champlain beach grass, or Ammophila breviligulata ssp. champlainensis. American beach grass is native to the United States. It is commonly seen growing along the Atlantic coast and along the shores of the lower Great Lakes, according to the University of Texas. It is also found in California. European beach grass is not native to America. It was brought to California in the 1800s and planted to provide stability to shifting sand dunes so that the newly-built railroad tracks would not become covered with sand. The beach grass quickly spread and is now found along the northern coast of California and southern coast of Oregon. Champlain sea grass is found along the shorelines of the great lakes, where it migrated from the Champlain sea before it was cut off from the Atlantic coast. American beach grass features clusters of thin leaves, from which one stem arises. The leaves average about 1 foot in length, while the stems, which are topped by panicles (long, thin stalks of tiny flowers) can be up to 3-feet tall, according to the University of Texas. European beach grass grows on rhizomes, forming a dense mat. The slender leaves, stems and panicles can reach 2 feet in height. Champlain beach grass has long, slender leaves and stems that are about 8-inches long. The panicle sits atop the stem and is another 4- to 6-inches long. 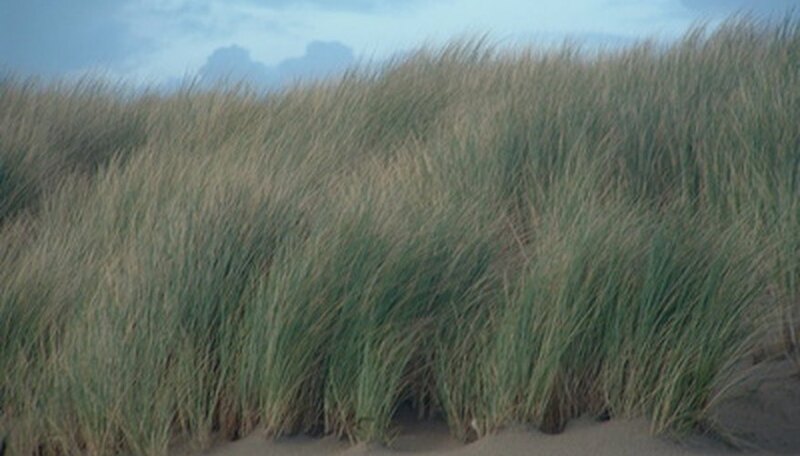 All three beach grasses can tolerate sandy and salty conditions. They have deep, strong roots or rhizomes (in the case of European beach grass) which anchor them to the sand, even in extremely windy conditions such as hurricanes. All three grasses flower in late spring and early summer, although European beach grass tends to bloom a bit earlier than the other two. The grasses are drought-tolerant, but need exposure to full sunlight in order to grow well. American beach grass is a hardy, desirable plant that is not bothered by pests or diseases. European beach grass is such a prolific grower that it crowds out desirable, native beach plants. It also overruns the sandy habitat of the Western Snowy Plover, an endangered bird species, and shelters predators of the bird. For these reasons, local governments along the northern coast of California and southern coast of Oregon recommend removing patches of the grass whenever possible, according to Humboldt University. Champlain beach grass is being threatened by development and the rapid spread of American beach grass.